Fresh craft distilleries have been flourishing all over the state. Outlaw Distillery, a family operation in Midvale, opened its doors in January and features a DIY still setup built entirely by owner Kirk Sedgwick. 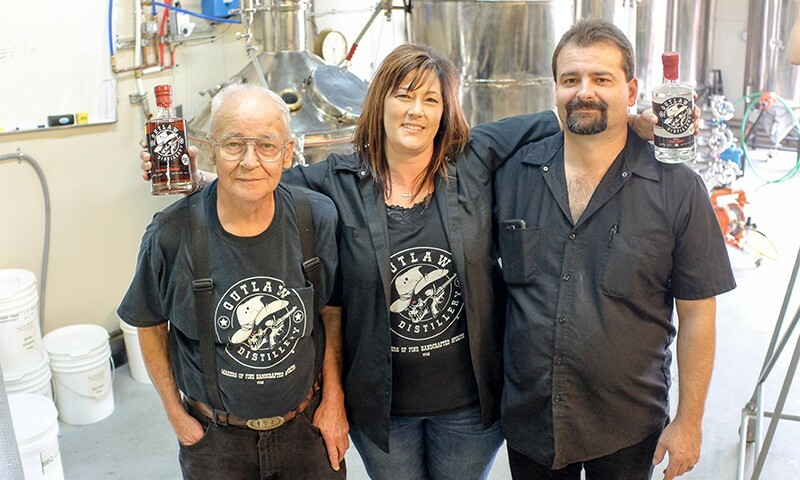 Kirk, his wife, Denise Sedgwick, and his father, Bob Sedgwick, have produced an eclectic collection of small-batch spirits, from moonshine to spiced rum. These liquor renegades at Outlaw are branching off from the standard liquor road at every turn possible. To the surprise of both Kirk and Denise, their most popular seller is their white whiskey. This recipe is made with wheat as the grain and a few added, clandestine ingredients. “Our white whiskey is our bestseller,” Kirk says. “For an un-aged whiskey, I like using wheat because it’s easier on the palate. Our wheat whiskey is smooth and sweet, and we add oats to give it an old, mill-ey finish.” Their spiced rum flies off the shelves as well and features a unique infusion of herbs. “Rum has to be made out of sugarcane product, so ours is made with molasses,” Kirk says. “As far as the spices go, we use cinnamon, nutmeg, cloves, vanilla, ginger and cardamom. We wanted to spice the rum way different than any other you’ve ever had.” This delicious blend of spices provides a piquant flavor that sets it distantly apart from its competitors. Moonshine is the newest addition to their stock. Liquors in this family are often improperly defined. “The true definition of moonshine is liquor made they’re doing something illegal.” Many moonshines sold in liquor stores are distilled into flavorless oblivion, but a true moonshine still retains some of its zest. “[Our moonshine] is un-aged, and nothing fancy is done to it,” says Denise. “It’s not a neutral spirit, like vodka, which has no flavor.” Outlaw‘s moonshine is made from wheat, like their whiskey, and flavored with touches of molasses to give it a sweet, rum-like finish. 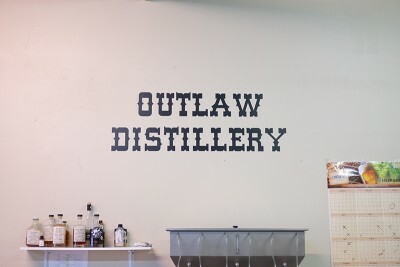 You can find almost all of Outlaw Distillery’s spirits in the liquor store, though getting their bottles on the shelf has been a ludicrous and drawn-out process. “As far as I know, we are one of the only bourbons in Utah right now, but they won’t let it on the shelf,” Kirk says. “They didn’t give us any specifics why.” Even after getting approved for the liquor store, the complications aren’t over, Denise says. “You request a P.O., then it takes a couple of weeks to get it. Then you request a delivery date, and that’s three weeks out. It just seems like everything is ‘Hurry up and wait.’” They hope to have the bourbon on the shelves shortly, and in the mean time, you can still buy their white whiskey and rums. It is one thing to be dissatisfied by the theocratic laws in this valley, but in order to provide solutions, everyone needs to be involved in the voting process. “Until the people that want to sway politics in the other direction go to the voter booths and actually vote, it’s going to stay the same,” Kirk says. “People complain to me all the time, and I ask, ‘When was the last time you voted?’” This coming session, a bill will be put to a vote to allow breweries and distilleries, like Outlaw, to have tastings. 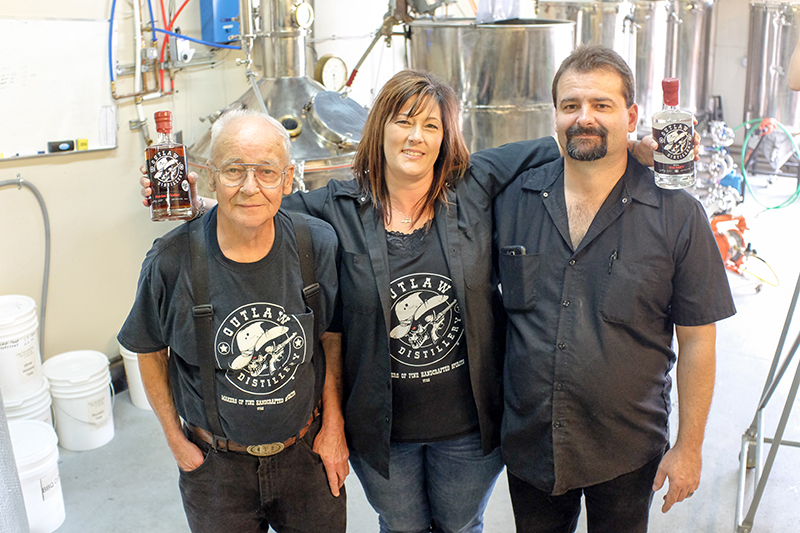 Outlaw Distillery is there to inspire us to make waves, and down some fine fire water while we do.